This is always a difficult dilemma for gamers on a budget: what do you do when you want to play classic games on their original systems, but can’t afford or don’t have space for a vintage gaming collection? If you live in the Denver metro area, you go to Channel 3 Retro Gaming Center. A hybrid gaming shop, arcade and something of a lending library, Channel 3 is located on 1825 Youngfield St just off of the I-70 exit in Golden, a southwestern suburb on the outer limits of what’s considered the metro area. Located in a small shopping center, it’s something of a hole in the wall. In fact, when I went looking for it, I almost drove past it, only forced to turn around when I saw a sign for ‘video games’ and a big cutout of Mario leading the way. Once you go inside you’re greeted with a display case full of games for sale on your right, and for a $5 admission fee for children, slightly higher for adults (though for groups you can arrange a discount) a selection of free play retro arcade cabinets on your left, including some seldom seen sights like Missile Command and Rampage. But what makes Channel 3 truly unique is its other option. In addition to access to the arcade cabinets, for the admission cost you can play a huge library of retro games on their original consoles on one of the many TVs set up on the floor. And the library is quite impressive. Games like Zombies Ate My Neighbors, Final Fantasy Mystic Quest, and Contra are all available for you to play as long as you stay in the store. And you are welcome to bring in your own memory cards to save your progress on longer games like JRPGs. With a stamp on your hand you can go in and out as many times as you need during hours of operation, which go well into the middle of the night on weekends. Tony, the co-owner and operator of Channel 3 wanted the feel of the business to be somewhere between the kinds of arcades he grew up with—a social hub where anybody with a passion for gaming can come and play, and that basement of the coolest kid on the block. Gregarious and friendly, not only does Tony regularly check to make sure everyone is doing okay as they play, he’ll strike up a conversation and offer to play against anyone in the arcade. In my experience a lot of privately owned gaming shops are run by pretty sullen and off-putting cashiers, so a genuinely welcoming and outgoing owner is refreshing and makes me want to come back on a regular basis. Stools and chairs are available for almost every cabinet, something a disabled gamer such as myself can appreciate, and there are comfortable couches all over the place. Tony, a carpenter by trade, made all the furniture himself, which in addition to welcoming and comfortable, are also quite beautiful and have a wonderful style I’d love to see in a store someday. Because of his skills, he and his partner maintain and restore all the cabinets themselves, and are always on the hunt for new machines. One of the biggest frustrations on a cabinet is limp, unresponsive controls, but at Channel 3 almost all of them are in peak condition, and the few that aren’t get dealt with quickly. The arcade is also clean, homey and has a fun display of vintage gaming merchandise and console boxes on the walls, making the center as much a museum as it is everything else. Though art on the walls, done by a local artist, are available for sale as are game related goodies. Channel 3 also has a good selection of snacks and treats to munch on as you play. There are traditional snacks like M&Ms and chips, as well as Japanese snacks and specialty sodas. The treats are also reasonably priced, unlike many other gaming facilities where food gets a huge markup. I had a Frostie’s Blue Cream, which was probably one of the most delicious drinks I’ve ever had, and only cost $2. The center, as charming and fun as it is, is of course not perfect. Even looking for it it can be hard to find since signage isn’t super visible from the road. Because Tony and his partner are basically the only employees, and don’t work at the same time, he can’t be everywhere at once. It can be a while before he’ll help you out with a problem with a machine or console, or check you out for a game or snack at the register. The rules and policies for the center aren’t clearly outlined either, and when I first came in I didn’t know that the games were free to play once an admission fee was paid. My boyfriend and I were pretty lost until the owner showed up to explain how the center worked, and even then somethings weren’t clear—like how to borrow and return the games that are behind the cashier counter. As the center gets busier they’ll probably want to institute a better check out/return policy for borrowing the games to make sure no one five finger discounts them or any of the accessories. They’ll also probably want to invest in some extra help to make sure there’s no huge wait for getting snacks. While the retro games are pretty decently priced, there isn’t a huge selection of things actually available for sale, though what is available is definitely top notch: both Chrono Trigger and Earthbound were in stock when I looked. If your interest is more in growing your personal collection rather than simply experiencing the games, you may have to look elsewhere until their stock increases. The cabinets are also mostly fighting games, side scrollers and western developed games. 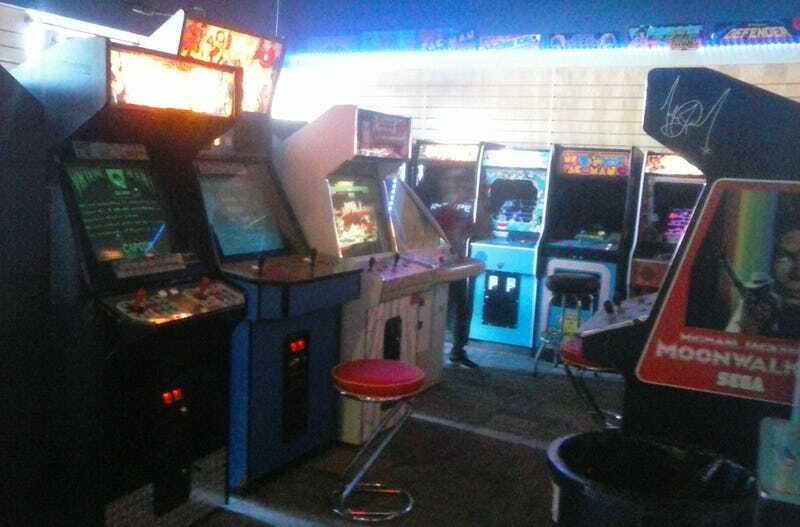 If you want lightgun games, rhythm games or more Japanese games, you’re better off at some of Denver’s other vintage specialty arcades, but as a reminder, they are constantly expanding. I found Channel 3 while cruising for used games on Craigslist ad expecting a used game store like the local Level 7 and Buyback Games chains that are staples of the Denver Metro Area. It was a complete impulse to go and what I found was so much more. Channel 3 Retro Gaming Center has only been open a couple of months and are still growing, and I hope they’ll be around for a long time. It’s a great hybrid of store and arcade, and the ability to try out and play games under circumstances you otherwise might not be able to makes this a real value both in terms of money and time. I look forward to a repeat visit to Channel 3 and hope anyone in the Denver area also gives them a chance. I was not compensated or paid for this review by any party and am not an employee, relative or close personal friend of the owners of Channel 3. Channel 3 Retro Gaming Center is located on 1825 Youngfield St, Golden CO, 80401. Their site is onchannel3.com. Their hours of operation are Tuesday-Sunday and open in the afternoons and stay open until midnight, later on weekends.